When the latest series of iPhones are released about this time each year, we love to see how they measure up to the competition. The comparative evaluations are typically based on specs – number of cores, processor clock speed, RAM, removable storage – and increasingly on performance benchmark scores. But what about the value that customers receive over the life of the device? iOS 12 is enabling Apple to do something no other mobile device manufacturer is remotely able to do – keep your six-year old iPhone up to date and relevant in today and tomorrow’s Apple ecosystem. I know, it seems like we write about Apple quite a bit, but in our view Apple is a tremendously innovative company that has developed significant competitive advantages through years of thoughtful design, planning and development of its “ecosystem.” At the center of Apple’s ecosystem resides its operating systems, most notably, iOS. 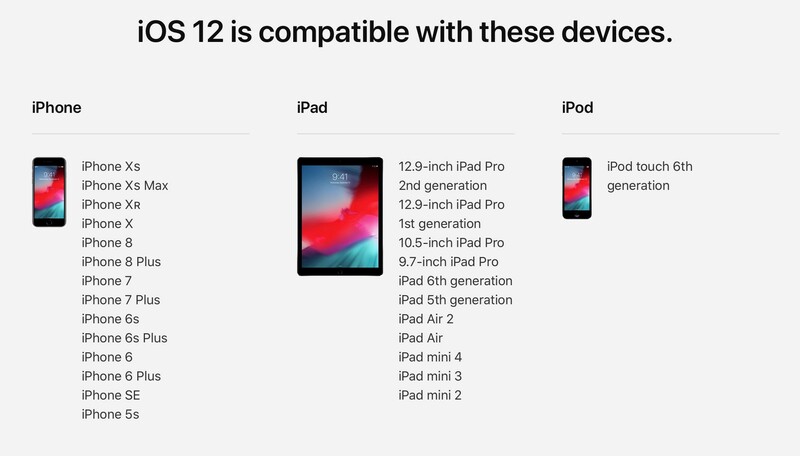 iOS 12 Compatibility Chart Source: Apple Inc.
iOS 12, released on the 12th of September, is the latest version of iOS that supports the five-year-old iPad mini 2 and the six-year-old iPhone 5s on release day. 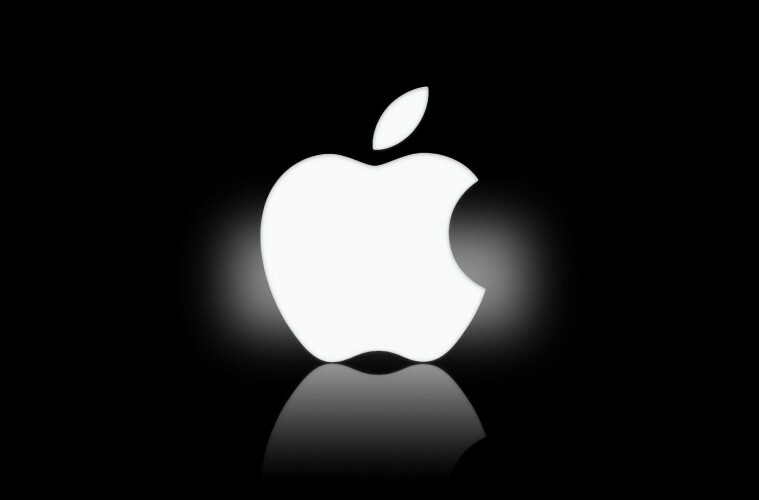 That means approximately a billion iOS devices (Apple reported surpassing 1.3 billion devices as of January 2018) or more will be running the latest version of iOS in a matter of a few months given the high adoption rates that Apple historically enjoys among iOS device owners with approximately 85 percent of active iOS devices running iOS 11 one year after its release. That’s about a billion actively used devices. In comparison, after 9 months after its release only 14.6 percent of the installed base of Android devices accessing Google Play are running Android 8 (code name: Oreo). Assuming there are 2.3 billion Android devices in use today, about 335 million devices are running the latest version of Android, far shy of the estimated devices running iOS 11. Why this slow uptake in the Android universe? Because there are tens of thousands of Android phone models that are and have been put into circulation by thousands of Android device makers like Huawei, Xiaomi and Oppo. Many of these devices are running forks or customized versions of Android with proprietary skins requiring the handset maker to develop and test their bespoke flavor of the Android operating system and skins across their portfolio of new and old devices, and test upgrades, updates and patches across carriers – a very expensive and time-consuming effort. As many Android device owners know, you are lucky if you get an OTA (Over-The-Air) update of the latest Android OS from your carrier or OEM weeks if not months after the release date, though an increasing number of handset vendors are launching their flagship models with the latest Android load. You are lucky if you get Android OS update support for your smartphone after a year with very few OEMs able or willing to invest in ongoing updates for older devices. In short, from a software perspective your Android device is effectively obsolete at the time you buy it or within months thereafter depending on the timing of your purchase and when Google releases the latest version of Android OS. Obsolescence is not necessarily a hardware thing anymore. It is primarily a software thing. As we have seen over the last couple of years, the gimmick-oriented focus on mobile device innovation has waned as most smartphones and tablets are starting to hit peak practical specs and features for the kinds of applications that most of us run on a daily basis. We don’t talk about cores and memory anymore, right? At the end of the day, performance, quality and value are what matter. Apple’s ability to keep the aging segments of the iOS active installed base relevant is extending the useful life of iOS devices and is enabling the majority of users to access and consume the latest applications, services and features that the Apple ecosystem has to offer. It is also one of the key reasons why mobile app developers find it easier to develop for and monetize their work on the iOS platform versus Android – a massive market of users that can use the latest software technology incorporated in their applications. Of course, older hardware will not be able to take advantage of all the new features of iOS 12 such as ARKkit, the Measure app and Siri Suggestions/Shortcuts, but the lowest common denominator for applications and OS functionality is still the vast majority of the enhancements that come with the latest iOS update. Since iOS 10, the hole that has sunk iOS devices into the dark waters of obsolescence has been the 32-bit processors that last came installed in the iPhone 5. As of January of 2018, Apple has made an aggressive push to transition the app ecosystem to 64-bit firmly nudging developers to update their applications to the new standard. Google is making a similar push to get developers to adopt 64-bit support for new and existing apps. But only 40 percent of active Android devices can run 64-bit code. The question remains, will Apple keep the iPhone 5s out of the cold depths of obsolescence for an unimaginable seven years with iOS 13? If it does, we can expect to see the installed base of iOS devices continue to expand at a rapid clip as iOS devices experience extended use through longer use, as hand-downs to friends and family members or circulation in the massive secondary market for iOS devices. Upgrade support longevity certainly keeps Apple’s ecosystem fertile and poised to deliver differentiated value to its customers for the foreseeable future. Just as important, device longevity through extended OS support makes the iPhone significantly more than just the hardware. Device manufacturers should recognize that going up against Apple requires a strategy that goes beyond the device. Fortunately for the low and mid-range of the smartphone market, Apple has left plenty of market share for Android device makers. 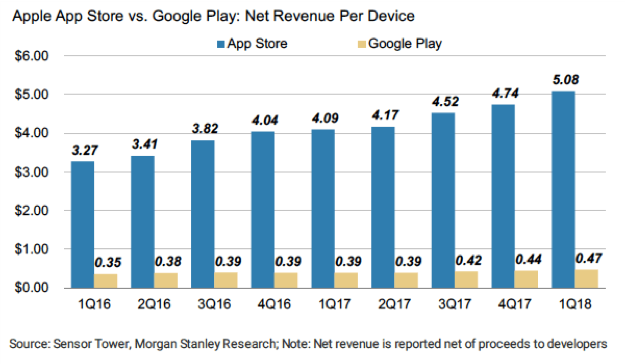 Winning Android device manufacturers will not win on price, they will win on long-term customer value delivered through an “ecosystem” play that will likely not look like Apple’s due to the nature of the Android ecosystem. Time to get innovative and approach ecosystems with clarity. Enterprise business leaders should recognize that in an increasingly digital world, ecosystems mean more than partnerships, developer communities and value networks. Ecosystems are very complex that have interrelated and interdependent business, technology and cross-industry layers. A successful ecosystem play may not mean building a massive ecosystem like Apple has, rather positioning your business in the context of an ecosystem in a way that unleashes differentiating value for you customers. Leonard Lee is the founder and managing director of neXt Curve (www.next-curve.com), a U.S.-based research advisory firm that focuses on helping business leaders define the digital future of their organizations and industries. Mr. Lee is a former managing partner with Gartner Inc., IBM and PwC with a rich background in advising some of the leading Global Fortune 100 enterprises with their digital journeys.